The ENDURA Window Series offers the highest quality craftsmanship at peak energy performance. The Endura Series, including the 110 single hung, the 100 picture window, and the 120 slider window, also offers a wide range of options to fit your home and your lifestyle. Cool Pane glass comes standard. Warm Edge Spacer System that limits thermal transfer for greater efficiency. Standard window configuration meets ENERGY STARTM performance requirements for most areas, optional upgrades available to cover other zones. New Generation PVC vinyl never needs painting or caulking. Pinch fusion-welded frames and sash create a solid, one-piece unit that reduces water penetration. Available in standard colors with a wide range of grille options to personalize your look. Variety of architectural shapes available. 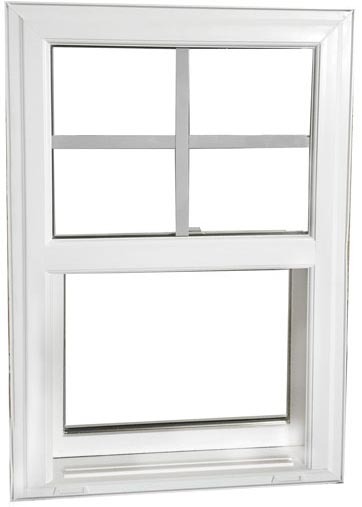 3 ¼ inch frame depth for traditional pocket window installation. Interior and exterior accessory grooves allow for a variety of installation options. Click HERE to see our Limited Lifetime warranty. Cool Pane glass package standard – Dual Pane insulating glass unit with double strength Low E glass and Argon gas fill. Fusion Welded corner Construction creates strength and long term durability for larger glass options.